Bognor’s veterans ended the club’s season with a flourish, beating St Albans 63-36. First impressions can be deceptive and when St Albans arrived at Hampshire Avenue, they seemed full of high spirits and up for an afternoon of ‘friendly’ rugby. But, as is often the case, when the whistle blows, creaking bones and aching muscles are forgotten as the old boys on both sides become spring chickens again. St Alban were quickest out of the blocks, scoring their first try within five minutes. Bognor managed an early unconverted reply and thought they could now take control. 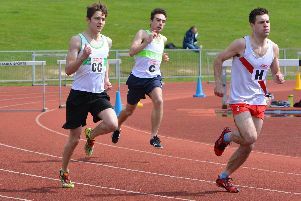 But St Albans, containing many veterans at the younger end of the age group, were able to use power and agility to their advantage and scored again to stretch their lead. Bognor, with five players over 60 (two being over 70), showed the benefit of experience and guile and fought back, finishing the first half with a slender lead. Early in the second half, Bognor began to pull away scoring several times. However, St Albans wouldn’t lie down, continuously bouncing back with tries of their own. The sun-baked ground and advancing years of some of the home side began to take their toll but Bognor were able to rely on the speed and superior footwork of O’Brien, who intercepted a loose St. Albans pass and sprinted in from the halfway line. This hammer blow seemed to knock the stuffing out of St Albans, who began to flag. Bognor’s dominance up front and pace in the backs allowed them to finish with a flurry of tries and a healthy 63-36 win in front of a jubilant home crowd. Bognor: Mitchell B, Mitchell P, Mitchell N, Hay R, Hay C, Brown D, Brown P, Baldwinson, Sweeny, Emmett, O’Brien, Baker, Riley, Pigden, Robinson, Luxton, Ellis, Shipp, Rimmer, Morgan, Howard, Hornibrook.